A tweet by Jon Eisen last night reminded me what a pain it is to format figures so they are acceptable to the PLOS journals' system. Kate Stafford was particularly annoyed at the idea that she'd have to spend hundreds of dollars on Adobe Illustrator, just to carry out the required format conversion. 1. Open the PNG from the File menu. You will need to do this one page at a time. 2. Crop the image: Use the Crop Tool (third row, second from the right, looks like a knife blade) to select an area close to the borders of your image. Hit Enter to apply the crop. 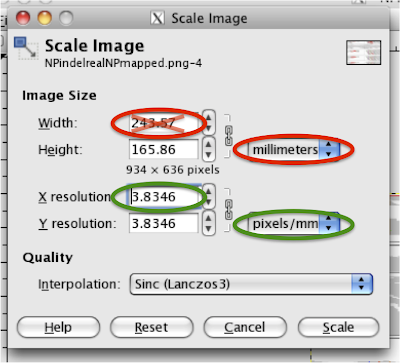 3.Resize the image: Under the Image menu choose Scale Image (see screenshot below). In the pull down menu next to Height (RR: red oval on right), set the units of measurement,to millimeters. If the Width is over 173.5mm, type 173.5 in the Width box (RR: red oval with an X in it) (17.35cm is our maximum allowable width for figures) and hit Tab. The new Height of the figure will appear, scaled proportionately to the change in Width. The Width cannot be below 83.0mm, and the height cannot be more than 233.5mm. If the Height and Width are within these prescribed limits, no adjustment to your figure size needs to be made. 4. From the File menu: choose Save As. Click the + sign next to "Select File Type (By Extension)". From the menu that appears, select TIFF. Click Save. Set Compression set to LZW. If you're prompted about layers in the file, select Flatten Image. Step 3 of the recommended process above tries to shrink the image by adjusting its size in mm to below 173.5. Resizing this way massively downgrades image quality. The work-around is to use the lower set of controls to increase pixels/mm instead of decreasing mm. This causes a correlated change in the size of the images, so doesn't degrade image quality. First do use the upper drop-down menu to set the image size units to millimeters as instructed above (red oval on right). Don't change the numbers in the box in the other red oval. 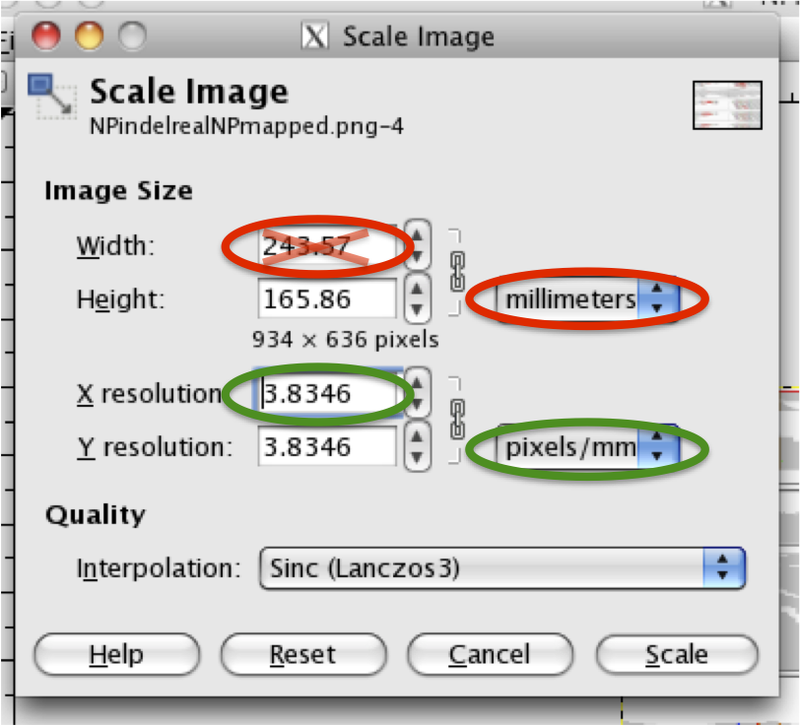 Instead use the lower drop-down menu to change the resolution units to pixels/mm (green oval on the right), and use the box beside it (other green oval) to increase pixels/mm until the image size (in the other red oval) falls to ≤173.5 mm. This ought to be fixed in PLoS's instructions to authors, so that people can use open-source software to get their images to PLoS's specifications. ResearchGate (which I generally ignore) has pointed me to what looks like an excellent paper on DNA uptake specificity in the various Neisseria species. 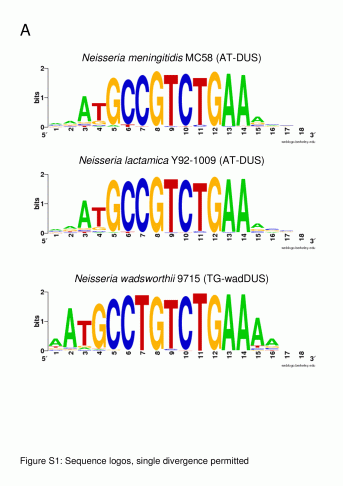 It's titled "Dialects of the DNA Uptake Sequence in Neisseriaceae" by Stephan A. Frye, Mariann Nilsen, Tone Tønjum, and Ole Herman Ambur. It's open access in PLOS Genetics; you can read it here. Another two-month gap - I really don't know why I haven't been blogging. (Probably something to do with the massive preparations for my online Useful Genetics course at Coursera (RRTeaching update here). The RA has done a fabulous job on her purine-regulation paper. 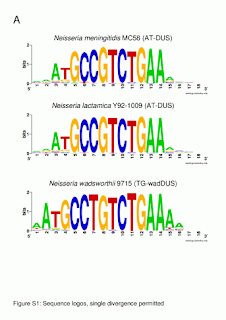 She designed and carried out the experiments and wrote the paper with only minimal input from me, sent it first to Nucleic Acids Research, and when they bounced it back sent it right off to Molecular Microbiology. They provisionally accepted it, with only minor revisions (no new experiments), and she sent the revised version back to them within a few days. Our NSERC grant proposal was successful, which is nice. It wasn't rated very high so we have only a small amount of money, but it's for five years. We still have quite a bit of money from our former CIHR grant (continuing under an automatic no-cost extension) so even if my next CIHR proposal fails we'll still have money to run the lab and support at least one grad student. The RA will be leaving us soon, but fortunately for everyone she has a great new position in the new building across the street. For this next CIHR proposal (due Sept. 15) I'm going to go back to our strength in regulation. Several areas need to be investigated. One is the purine regulation - the RA made a start into probing the biochemistry, but this needs to be taken further. She's also getting some new results on how CRP and Sxy interact. And there's the long-standing puzzle of how mutations in murE hyper-activate the competence regulon.